I love this cravat. The pictures are an accurate representation of the real life product. The quality is very high as well. Have yet to wear it! Everything went well from order to delivery. Item was as described in terms of quality. Will use again. Our selection of cravats will help you complement both semi-formal and casual outfits with a unique style element. 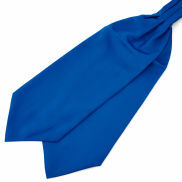 What's best, you can even tie one up as a wedding cravat, which is the perfect accessory for that kind of celebration. We offer ascots and wedding cravats in a variety of colours and patterns to suit anyone's taste. If you've ended up here, you probably already know what a cravat is. But just in case you're still a bit unsure about what cravats, wedding cravats, and ascot ties actually are and when you should wear them, keep on reading. There are 2 main types of cravats, day cravats and wedding cravats. Day cravats are the most popular these days, while wedding cravats are usually only still worn for weddings (you probably could've guessed that one). The day or casual cravat (also referred to as ascot cravat or ascot tie) is a fabric neckband, traditionally made of silk, that is worn loose around the neck for decorative purposes. It's usually tucked into a shirt with an open collar. 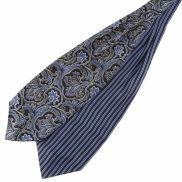 If tight collars are not your thing, the cravat is a great alternative to the classic necktie. A cravat adds some flair to your outfit while keeping it a bit more casual and loose than with a neck or bow tie. There are 2 types of wedding cravats. The modern wedding cravat very much resembles a regular tie, but has a scrunched knot and is wider than most regular ties. It's a popular necktie alternative for more formal weddings. All of our ascots can also be used as a wedding cravats, if you manage to tie them up correctly, that is. The more traditional style wedding cravat has 2 pieces of fabric folded on top of each other that are held together with a cravat pin. This style is quite rare these days. We offer cravats in a wide range of fabrics to suit any dapper man's needs. Silk: Traditionally, soft silk was used to manufacture cravats, and a lot of men still prefer this fabric because it's soft and lightweight. Silk cravats are very comfortable around the neck. Silk & cotton: Cravats with a silk front and cotton backing have become popular because they're easier to tie than all silk cravats. They're usually also slightly cheaper, but a bit heavier. 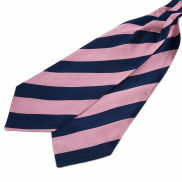 Polyester: Cravats made of polyester have become very popular because of their cheaper price and durability. High-quality polyester is still very soft and comfortable around the neck, though it doesn't have exactly the same premium look as silk. Wool: Cravats made of wool are quite rare. They provide a unique alternative to traditional cravat fabrics that's guaranteed to stand out. A great choice for winter. Cravats are great for adding a bit of flair to your outfit, so don't be afraid to pick out some bold and colourful patterns, especially when buying a day cravat. If you're wearing a cravat with a large and colourful pattern, we suggest you pair it with a solid colour shirt. If you go for a solid colour cravat, then feel free to match it with a patterned shirt or jacket of course.